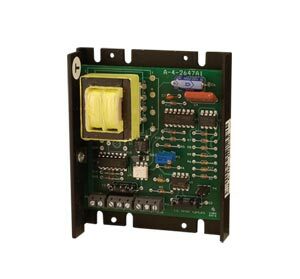 The OMDC-VSI (voltage signal isolator) permits the user to control the output of a variable speed motor drive from any external grounded or ungrounded DC input signal. A single model accepts a wide range of input voltages (0 to 5 through 0 to 25 Vdc or 0 to 25 through 0 to 250 Vdc). The GAIN trimpot is used to adjust the output of the OMDC-VSI to full on when a full speed signal is applied to its input terminals. The OMDC-VSI incorporates a feedback circuit, which virtually eliminates output changes due to the thermal drift of logic components. The OMDC-VSI is packaged in an aluminum chassis mount housing and contains an on-board power supply for its logic circuit. An electrical isolation rating of 2500 Vrms is achieved by the use of an optically isolated IC package. The OMDC-VSI can be used with virtually any motor speed control that has a speed reference circuit of +5 to +15 Vdc and an input impedance greater than 47 kΩ. The output of the OMDC-VSI is a DC voltage that is directly proportional to the input speed signal. The wide input range allows the OMDC-VSI to follow signals as low as 0 to 5V logic levels and up to the 180 Vdc levels present at the armature leads of a 180 Vdc motor. By simply connecting the input terminals across the armature leads of a "master motor", you can use the OMDC-VSI for master/follower operation. The addition of a scaling pot will provide for proportional follower operation.